An Eastern Star Yacht Charter getaway that will rejuvenate you, leaving you relaxed and invigorated with memories that will remain with you when you return. We pride ourselves on our amenable staff which creates a yacht cruise vacation that exceeds your desires, meeting needs you didn’t know you had. Our premier accommodations and delectable cuisine combine quaint comforts and sophisticated style allowing you to unwind in a variety of ways. 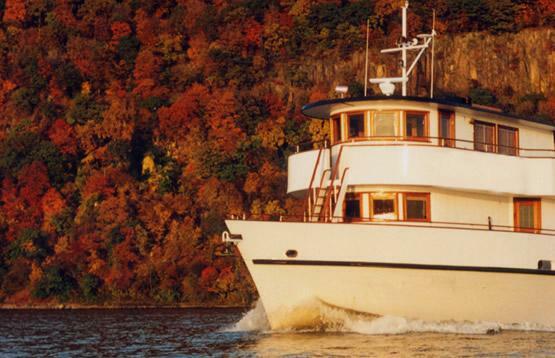 Our yacht charter cruise can take you to any nook in the New York and New England area. The sea is open to you and your guests. View the fall foliage that lines the shores of Connecticut and Massachusetts, or journey up to the Hudson River Valley for wine tasting. Visit Block Island, Nantucket, or Montauk and have your own private beach vacation. Drop by East Hampton or Sag Harbor for a day of shopping and dining at some premier restaurants. No matter your chosen destination, the journey on the Eastern Star will be the highlight of the trip.